Melting Pot: Opera San José heats up the fall season with its production of Robert Ward's 'The Crucible,' based on Arthur Miller's play about the Salem witch trails. 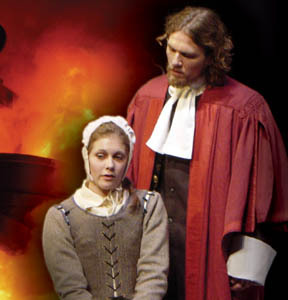 'The Crucible' runs Sept. 10-25 at the California Theatre. THE RICH VARIETY of fine classical music, opera and dance in Silicon Valley is well documented in what follows. In fact, the sheer quantity of excellent performance events gives the lie to those who predict that these arts are on their last legs. Meanwhile, the critical spirit always expects the best, even while those expectations are tempered according to the resources each producer or presenter possesses. It is no secret that a spirited youth orchestra will sometimes deliver a more exciting and memorable performance than a polished professional ensemble playing a familiar warhorse. Listed below are the best and most professional presenters, productions and artistseach with their own particular strengthsto be seen and heard this fall. A couple of focal points for the 2005-06 seasons are worth highlighting. Henry Molliconefavorite son, acclaimed opera composer and founder/conductor of the Winchester Orchestrawill get feted next spring during his "three-score" birthday. To pave the way for this signal event, the California Chamber Opera is staging the newly revised version of his 1981 opera, Emperor Norton, at Le Petit Trianon, Sept. 9 and 11. In 2006, the Santa Cruz Symphony will play a piece from his opera Coyote Tales (Mar. 18-19). His new Beatitude Mass will be premiered by the San Jose Symphonic Choir at St. Joseph Cathedral, March 31 and April 1. And the San Jose Chamber Orchestra is throwing a Mollicone birthday party on April 9. Worldwide, the season will also mark the 250th anniversary of the birth of Mozart. Among local celebrations, the San Jose Chamber Orchestra nails the exact date: Jan. 29. Symphony Silicon Valley has called on "Mozart enthusiast" George Cleve to conduct programs heavy with Mozart in December and January, and an all-Mozart bill in March. Opera San José starts a run of Don Giovanni in late April, and the Mission Chamber Orchestra includes a Mozart concerto in November. The season opens with Dennis Nahat's new production of Stravinsky's Firebird and a revival of Flemming Flindt's Phaedra with the Philip Glass orchestral score. Daryl Gray's new Cinema Soundtracks uses familiar movie music arranged by Bill Duncan, plus Nahat's Grand Pas de Dix to music of Glazunov for the second program. Nahat's popular Nutcracker holds sway in the second half of December. The opera's second season at its sumptuously restored new home in the California Theatre opens with Robert Ward's The Crucible, based on the Pulitzer-winning play by Arthur Miller. Ward will be on hand for opening night. Verdi's A Masked Ball takes the stage in late November. For 2006, pay special attention to Puccini's beloved La Bohème, which offers a chance to see the source material for the movie musical Rent, which opens at Christmas. Many of the company's top singers from last season are returning. Also, the company is hosting a reception for Frederica von Stade and Samuel Ramey following their joint recital on April 4. Conductor Patrick Flynn returns to open the season with Bernstein's On the Waterfront and Beethoven's Fifth Symphony. Composer performer David Amram will join orchestra soloists for his Triple Concerto in a program conducted by Paul Polivnik and Dennis Wilson for the second weekend set of the fall. George Cleve will conduct Mozart on the next three programs, including the Prague Symphony on Dec. 10 and 11, the Piano Concerto no. 22 with Stephen Prutsman on Jan. 21-22 and the Requiem on March 18-19. Classical events at Villa Montalvo's intimate Carriage House start Sept. 15 with the Ahn Trio. On Nov. 6, pianist Peter Serkin appears, followed by the Orion String Quartet, Nov. 13, and Festival of Four, Nov. 18. Robert Greenburg's four-part classical lecture series begins Feb. 5. In special performances at San Jose's California Theatre, opera stars Frederica von Stade and Samuel Ramey appear together April 4, and baritone Thomas Hampson joins the Library of Congress' "Song of America" tour on June 3. Barbara Day Turner continues her adventure with Grazyna Bacewicz's Concerto for Strings and Brent Heisinger's EKTA for the orchestra's first concert of the season. Works by Mozart will be heard on the 250th anniversary of his birth on Jan. 29. Turner celebrates composer (and pianist) Henry Mollicone, with singers and instrumentalists on April 9. Conductor Emily Ray is joined by violinist Pip Clarke to open the orchestra's 10th season with Beethoven's Violin Concerto in D. Helene Wickett plays Mozart's Piano Concerto no. 9, on Nov. 5, plus works by Ibert and Avshalomov. The society hosts solo piano recitals by Enrique Graf, Oct. 9; 2001 Van Cliburn gold medallist Olga Kern, Oct. 29; Natasha Peremski, Jan. 7; Stephen Swedish, Feb. 12; the 2005 VC-gold medalist Alexander Kobrin, Mar. 26; and Frederic Chiu, May 14. Michael Tilson Thomas opens the symphony's Flint season on Sept. 10 with an all-Russian program that features Alban Gerhardt as soloist in Shostakovich's First Cello Concerto. Herbert Blomstedt conducts Bruckner's Third Symphony and Grieg's Piano Concerto, with pianist Lars Vogt, Oct. 14. Oliver Knussen conducts Britten, Stravinsky and one of his own works on Nov. 4, with pianist Peter Serkin. On Nov. 25, Harry Christopher will lead Handel's Messiah, and the annual Christmas Spectacular will be conducted by Vance George on Dec. 18. Now in its 57th season, Mitchell Sardou Klein's Peninsula Symphony plays three concerts at Flint Center, opening Oct. 22 with Beethoven's Fourth Piano Concerto, featuring Jon Nakamatsu, and Mahler's First Symphony. In 2006, guitarist Angel Romero is scheduled to play Celedonio Romero's Concierto de Malaga (Jan. 21). All-male chorus performs throughout Bay Area; see www.chanticleer.org for details. Swing Fever, an evening of food and big-band musicNov. 12, 6-11pm, at the Crowne Plaza Hotel, Foster City. The group hosts Sunday concerts by visiting ensembles and guest artists. Concerts start at 7pm, with pre-show talks at 6:15pm; Le Petit Trianon, San Jose; $19-$34; 408.286.5111. A series devoted to pianists. Le Petit Trianon, San Jose; Sundays at 7pm (except as noted); $20-$45; 408.295.6500. The full season begins in 2006; War Memorial Opera House, San Francisco; 415.865.2000. From the August 24-30, 2005 issue of Metro, Silicon Valley's Weekly Newspaper.